Although North Harris has been recognised for its conservation importance for a long time, relatively little survey, monitoring and research work has been carried out in the area. The Trust is keen to find out more about the estate’s natural heritage in order to inform future land management decisions. Since 2007, as part of its grant support from Scottish Natural Heritage, the North Harris Trust has monitored the condition of two priority habitats within the Special Area of Conservation (SAC); Wet Heath and Alpine Grasslands – are monitored in alternate years. Both Wet Heath and Alpine Grassland within the SAC have been assessed by SNH as being in “unfavourable condition”, primarily due to grazing and trampling impacts from livestock and red deer. The Trust have agreed a Deer Management Plan with SNH which, combined with the ongoing reduction in sheep numbers on the estate, should improve the condition of these habitats over the long term. In 2008/9 numbers of deer culled were increased from 77 to 160, and we aim to sustain the cull at this level. The challenge over coming years will be to ensure that deer are culled in the more remote pasts of the estate as well as in the more easily accessible areas. The Trust’s monitoring programme aims to give an indication of how the habitats are responding to changes in sheep and deer numbers, and which areas are most affected by grazing and trampling. A number of points have been randomly selected within the wet heath and alpine grassland habitats. Each of these points is then visited on a biannual basis in order to record impacts of grazing. This involves checking for presence and absence of certain species, the amount of trampling and dung at the site and assessing the level of grazing of heather shoots and other species in the area. North Harris currently holds around 13 pairs of golden eagles, eight of which nest within the North Harris Special Protection Area (SPA). This represents an exceptionally high density of eagles, only equalled in a few other areas of the Hebrides. The breeding success of North Harris eagle pairs is also known to be good, probably due to the availability of mountain hares which are the main prey source during the breeding season. This contrasts with many other areas of Western Scotland where as a result of the wet climate and sparse prey populations breeding success is often poor. 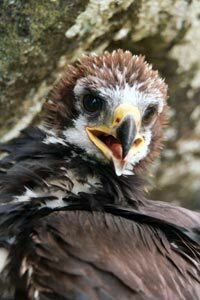 Since 2010 the Trust, along with volunteers from the Lewis & Harris Raptor Study Group has been carrying out annual monitoring of the North Harris golden eagle population in order to assess and ensure the continued health of the population. In addition to eagle and vegetation monitoring we are keen to build up a better picture of the distributions of species that occur on the estate. any noteworthy records are greatfully received.